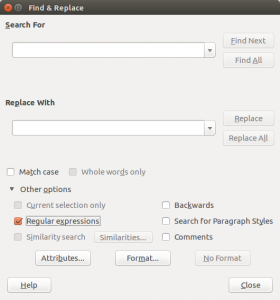 LibreOffice offers a powerful search and replace option of regular expressions – like, for instance, tabs, soft line breaks and empty paragraphs – based on the powerful International Components for Unicode (ICU) Regular Expressions engine. A complete list of the regular expressions can be found on the ICU Project website. 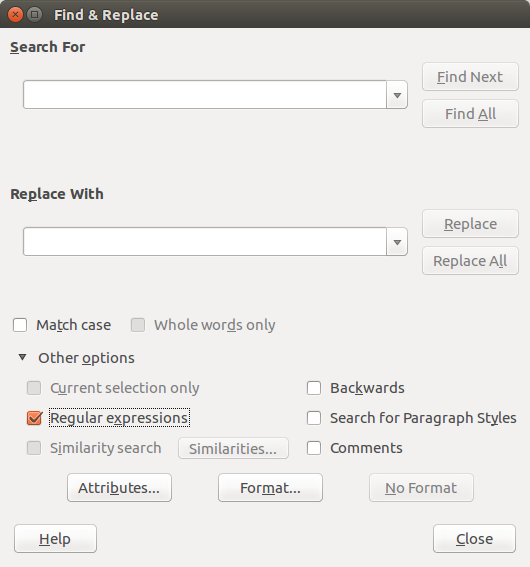 A list of the regular expressions most used by LibreOffice can be accessed via the dialog windows which opens when you enter Edit > Find & Replace… Clicking on the Other Options… arrow, you expand the list, from which you can select Regular Expressions. Hitting the Help button opens the relevant help page. Half way down the page, under Regular Expression, you can find a link to the list. Additional links at the end of the page provide further info on the topic.